The mission of the Police Department is to provide leadership to promote individual responsibility and a commitment to improving the community’s quality of life through crime control and public safety while serving all people with fairness and respect. 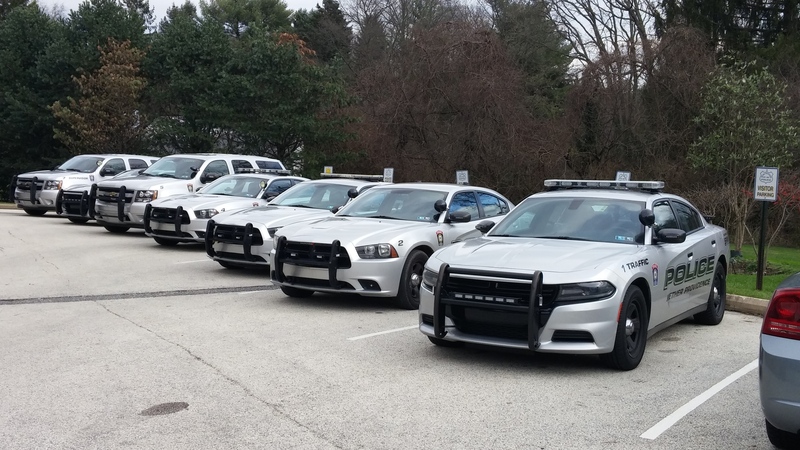 The Nether Providence Township Department patrols approximately 52 miles of state and local roads. The department consists of 16 officers — full and part-time, and one detective. Business office hours are Monday through Friday, 8 am to 4 pm. If you need to speak to or see an officer for an Emergency or Non-Emergency call 911. Traffic calming with patrols and the use of speed sign trailers. Chief David Splain is a 1981 graduate of Nether Providence High School and a 40 year resident of the township. He is a 1984 graduate of the Delaware County Police Academy, a 1985 graduate from Widener University with a Bachelor’s Degree in Sociology and a 1992 graduate of Saint Joseph’s University with a Master’s Degree in Public Safety. Chief Splain began his law enforcement career in 1985, working as a Summer Police Officer with the North Wildwood Police Department, the summers of 1985 and 1986. He was hired by the Darby Borough Police Department, where he worked as a part-time officer from 1986-1988 before being hired full-time with the Yeadon Police Department. Chief Splain worked as a Patrolman from 1988-1998, when he was promoted to Patrol Sergeant. He worked as a Patrol Sergeant until 2000, when he was promoted to Detective Sergeant, a position he held until he retired in June 2013. In June 2013, Chief Splain was hired as the Chief of Police with the Nether Providence Police Department. Sergeant Dave Bennett began his career in Nether Providence in March 1993 after serving as a police officer with the Delaware County Park Police and the Upland Borough Police Department. He is a graduate of Chichester High School, Delaware County Community College, Indiana University of Pennsylvania, and the Delaware County Municipal Police Academy. Sergeant Robert Elmore joined the Nether Providence Police Department in 1985. Before joining the department, he served for eight years as a part-time officer in other police departments in Delaware County. He has an associate degree from Delaware County Community College and graduated with honors in 1995 from the F.B.I. National Academy in Quantico, Virginia. Sergeant Elmore is a trained accident investigator and also a certified instructor for firearms, chemical weapons, less lethal impact weapons, and police baton. In addition to the F.B.I. Academy, he also has attended several police management schools. Sergeant Michael Montgomery began his career in 1994 with the Upland Borough Police Department after graduating the police academy in late 1993. After several months, he took a position with the Chester Twp. Police Department where he worked in the narcotics and patrol units. In both 1994 and 1996, Sgt. Montgomery was awarded the “Top Cop” citation for the police officer of the year as well as numerous life saving commendations. After leaving Chester Township, Sgt. Montgomery worked in Marcus Hook as a police officer until he was hired in 1999 with Nether Providence. Sgt. Montgomery became the township’s first K-9 officer in 2005 working with two different dogs certified in the field of narcotics detection. In 2006 he was promoted to sergeant and is currently serving in the patrol division. Sgt. Montgomery has training in narcotics, D.U.I. and was a certified Emergency Medical Technician. Sergeant Patrick Fisher was hired by Nether Providence Township in 2008. He is a graduate of Pocono Mountain High School in Monroe County, PA and West Chester University. Sergeant Fisher graduated from the Montgomery County Municipal Police Academy in 2005, where he was the valedictorian of his academy class. Sergeant Fisher was previously employed by Tinicum Township Police Department, Limerick Township Police Department and Morton Borough Police Department. Sergeant Fisher has received training in Criminal Interdiction, DUI Enforcement, Crisis Intervention, and Traffic Crash Investigation. Sergeant Fisher is also a member of the Central Delco Tactical Response Team. Detective Michael Erickson started with Nether Providence Police in 2000 after serving with the Morton Borough Police Department and the Delaware County Sheriff’s Office. He is a graduate of Sun Valley High School and the Delaware County Municipal Police Academy. Detective. Erickson also is a member of the Delaware County Major Incident Response Team. Patrol Officer D. Brian Bonnes has been a member of the Nether Providence Township Police Department since 1993. He is a graduate of Archmere Academy, Widener University, and the Delaware County Municipal Police Academy. He is a firearms instructor and a member of the Southeast Delco Tactical Response Team. Patrol Officer Michael Coverdale is a 2008 graduate of Sun Valley High School. He began his law enforcement career in 2009 as a graduate of the 125th class held at the Delaware County Municipal Police Academy. There he received the John Halota Firearms Sharpshooter Award qualifying with a score of 99.9% accuracy. Officer Coverdale was hired by the Collingdale Borough Police Department in November of 2011 where he was employed as a part time patrolman for four years before being hired as a part time patrolman by the Nether Providence Township Police Department in June of 2014. Officer Coverdale served for both police departments before being promoted to a full time patrolman for the Nether Providence Township Police Department September 1st, 2015. During the course of his career Officer Coverdale has attended numerous schools including Vehicle Search & Seizure, Basic Clan Lab Awareness, and Opioid Associated Overdose Prevention, Recognition, and Response Training, and has received training in the field of narcotics and D.U.I. Patrol Officer James Irey joined the Nether Providence Township Police Department in 2005. Patrol Officer Steve Kilian was hired by Nether Providence as a part-time officer in 2005. He was promoted to a full-time officer in 2006. Officer Kilian has been a police officer for seven years. He began his career in Colwyn Borough. Two years later, he accepted a position with Darby Borough’s Police Department, where he was employed for five years. Patrol Officer Matthew Liss joined the Nether Providence Township Police Department in 1999. Previously he worked for the Brookhaven Borough Police Department and the Delaware County Park Police. Officer Liss is a graduate of Widener University, Alvernia College, and The Delaware County Police Academy. He is a member of the Central Delco Tactical Response Team. Patrol Officer Michael Markunas began his career in Nether Providence in 2003, having previously served as a patrolman for Ridley Park, Trainer and, Darby Boroughs. A 1991 graduate of the Delaware County Police Academy, he has been in law enforcement for 15 years. Officer Markunas is active in the enforcement of DUI. Currently he is an instructor for Delaware County for Safe Driving, a course that educates first and prior offenders about DUI law and the physical effects of drinking and driving and the use of illegal drugs. Patrol Officer Kevin Smith has been with Nether Providence since 1999, Prior to joining the force, he worked for 10 years as a police dispatcher for The Delaware County 9-1-1 Center. He also served for five years with the Trainer Borough Police Department and for one year with the Brookhaven Police Department. Officer Smith is the Mobile Data Terminal instructor as well as the Jnet instructor for the department. Officer Smith is a Field Training Officer and is also a member of the Delaware County Major Incident Response Team. He also is in charge of department vehicles. Patrol Officer William Sweeney was hired by Nether Providence in 2008. He graduated from the Delaware County Municipal Police Academy. He began his career in 2006 with Glenolden Borough and also worked for the Delaware County Park Police. Officer Sweeney is a member of Delaware County’s Crisis Intervention Team. Patrol Officer Michael Worrell is a 2009 graduate of Academy Park High School. He joined the Pennsylvania Army National Guard in October 2009 and deployed to Afghanistan from November 2010 – November 2011. Officer Worrell is still currently serving in the PA Army National Guard at the rank of Staff Sergeant. In 2012, Officer Worrell attended the 137th Delaware County Police Academy class, where he graduated with the Firearms Sharpshooter Award for shooting with 100% accuracy at the range. In March of 2013, Officer Worrell was hired part-time by the Yeadon Borough Police Department. In June of 2014, Officer Worrell was hired part-time by the Nether Providence Township Police Department. He worked part-time at both Police Departments simultaneously until he was hired full-time by the Drexel University Police Department in December of 2014. Officer Worrell left Drexel University for the Philadelphia Police Academy in May of 2015, where he lateralled into the Philadelphia Police Department. Officer Worrell was assigned to the 16th District in West Philadelphia. In November of 2016, Officer Worrell was hired full-time by the Nether Providence Township Police Department. Kim Daniel, Administrative Assistant for the police department, came to Nether Providence in November 2004. She has an Associate Degree in Specialized Business from PJA School.